The wind was blowing in December 2009 when I took this photo at Fort Desoto in Florida. The Gulls had it hard on the beach with the wind blowing sand in their eyes. Another of my favorites from morning at Edisto Beach with the erosion fences on the shore. Edisto Beach, South Carolina offers great chances for vacationing with house rentals and also several resorts in the area. Read my roadtrip articles on the Examiner. Unfortunately, I live about 5 hours from Folkston, Georgia where this crossing sign (commonly called a cross-bucks) is located. It is located on the grounds of the depot as part of the museum collection. Everytime I'm there, I take at least one picture of it. That means I get pictures of it at dusk, dawn, middle of the day, and also in a variety of weather conditions. Even in Black & White, it is amazing how the light can play against the crossing, how the shadow lies, or what difference the background sky and trees can make. To some it might just be a crossing sign, but to me it is a small lesson in paying attention and becoming a better photographer. City Hall Horse 2, originally uploaded by Gene Bowker. 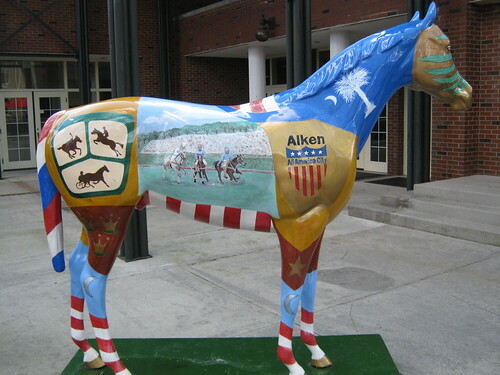 Here is the other side of the horse.. for those who asked :) The three equestrians on the rump.. represent the Aiken Triple Crown of Harness, Steeple-Chase, and Polo held every year. City Hall Horse, originally uploaded by Gene Bowker. 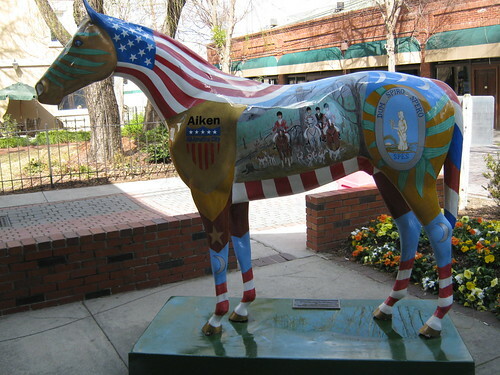 Aiken, the City of Horses, has a number of painted statues scattered around town. 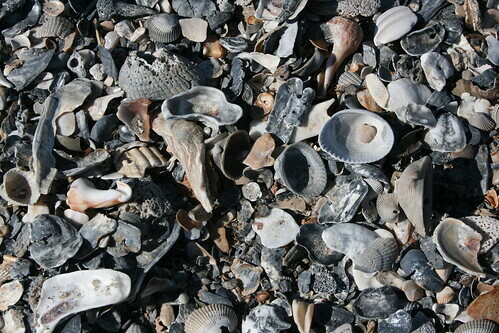 seashells, originally uploaded by Gene Bowker. I took this at Edisto Island back in late 2009. I was amazed when I got there that morning at the amount of seashells which were lying on the beach and even more at the variety. Ward Daughter 3, originally uploaded by Gene Bowker. 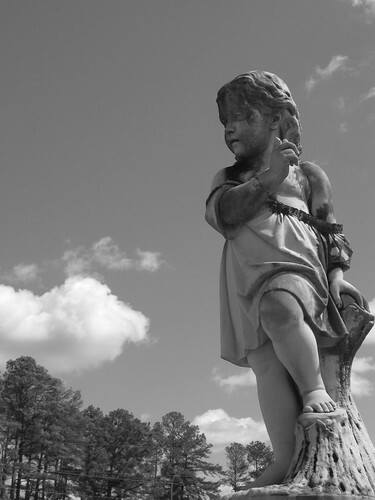 The Ward, SC cemetery was established in the mid 1800's and includes a number of statues such as the one captured in this photograph. The daughter of the town's father died young and he placed this monument to her which still stands today. What ya looking at buddy? Edisto Island is located on the coast of South Carolina and is a popular destination for beachfront rentals and fun in the sun. I visited Edisto at a quieter time last November. The beach fence above stood forlorn and lonely on the shore. If you go, make sure to visit the State Park located on the north end of the island. Where do crayons come from? Somehow I'd never thought about where crayons came from, except for the yellow crayola box. However, when I was visiting Sandusky, Ohio in 2006; I saw the abandoned American Crayon Company plant across the tracks from the Ex-NYC station. And you can visit the Crayola website here to see their factory tour. Everything is made somewhere.. finding out where can be a lot of fun. I took this photograph back in December at Fort Desoto park near St. Petersburg, Florida. The Pelican was sitting maybe 10 feet from the side of the pier in the dunes and seemed pretty oblivious to the tourists walking by. 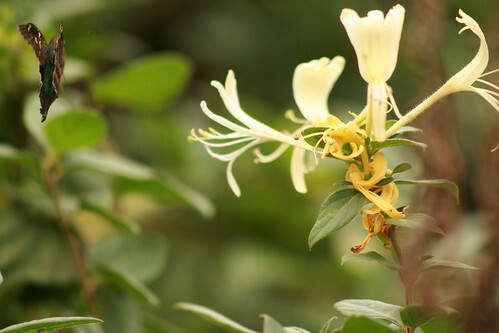 I'm working on getting my photographs uploaded to Zenfolio. This was one of my favorites that I took around Christmas last year. This to me is the real Florida.. or at least what it used to be. When Cindy and I were first married one of the things we really enjoyed doing was making memory books or scrapbooks of where we went. We have these books and can look back fondly on those times now. Over the years, with more digital pictures and less time we've gotten away from the habit of documenting where we went. I checked out this new software program which helps automate the process. My Memories Suite - Download The #1 Rated Digital Scrapbooking Software Now! 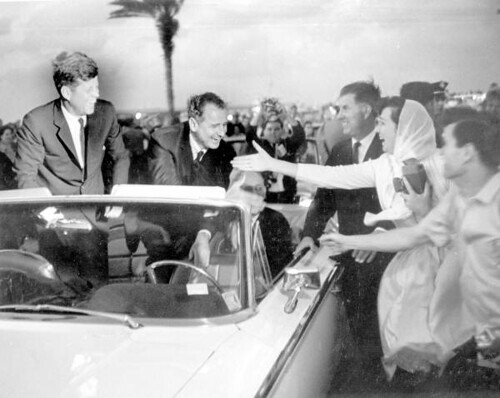 Crowd greeting President John F. Kennedy in Miami, Florida, originally uploaded by State Library and Archives of Florida. Amazing that this was only less than a week before he was killed. That was an end of an era of innocence. Today the President lives in a larger bubble than he did back then. 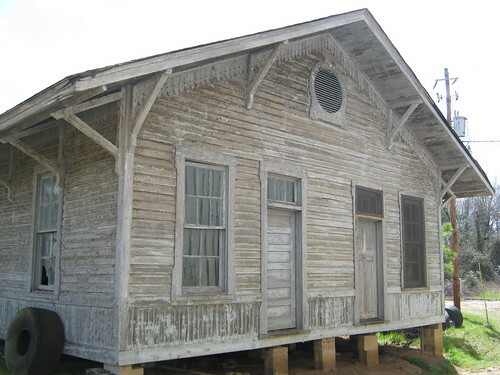 Ridge Spring Depot 3, originally uploaded by Gene Bowker. Hope you'll read my post on TwainToday regarding racism. I didn't get out and take any photos this weekend like I had planned to. I can't blame the weather on Sunday (it was gorgeous) and Saturday was my birthday so I could of gone if I had wanted to even though it was warm. I ended up spending the weekend relaxing at home with Cindy; reading and writing some articles and watching Bull Riding on TV. I did manage to sneak a nap in both days also. I guess I should feel worse that I didn't go out photographing.. but the rest was nice, and the quiet was wonderful. I even feel recharged this morning at work which is nice. There's always next weekend to get those photos I guess. marina reflections, originally uploaded by Gene Bowker. I liked the reflections of the posts. 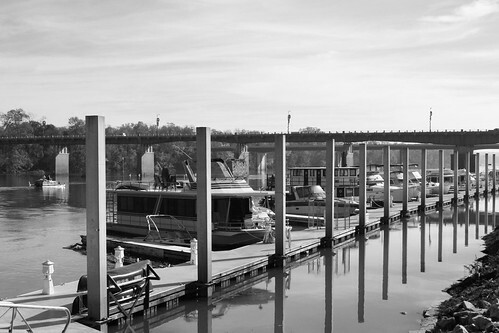 When the river rises, the entire marina can raise on the posts. This is along the Riverwalk in Augusta, Georgia and was shot in Nov 2009. Here is a good service if you have a bunch of old photos which you need scanned. Protecting your photos by digitalizing them is a great way to make sure that they will not be lost in case of fire or natural disaster. ScanCafe, the scanning service used by pro photographers and Pulitzer Prize winners. It’s available to you from just 29 cents an image. 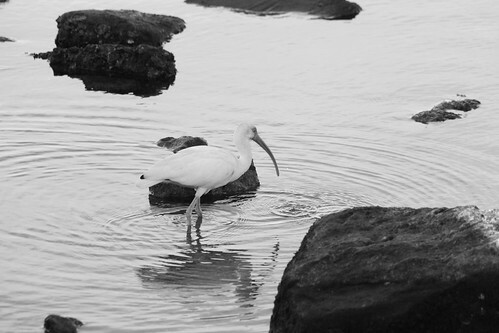 Wader B&W, originally uploaded by Gene Bowker. Shot in Florida in December 2009 near Bayport, the bird was stalking breakfast in this morning shot. fly away, originally uploaded by Gene Bowker. Ward Mem Detail, originally uploaded by Gene Bowker. I shot this in Ward, SC back in March. 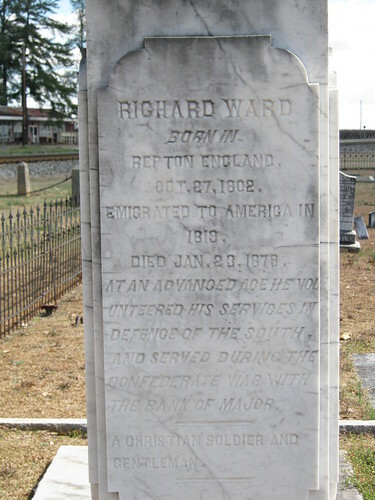 I just noticed this morning when going through the shots about him serving in the Confederate Army. He was born in 1802, so that would of put him in his late 50s to early 60s during the war, much older than the 30's which were common for officers on both sides. I'll have to do some more research to see if I can find some history of his service.